In my five months of being a mom, I feel that I have tried out more baby bath tubs than average. At first I bought the Complete Care 4 Stage Bath Center by Safety 1st. 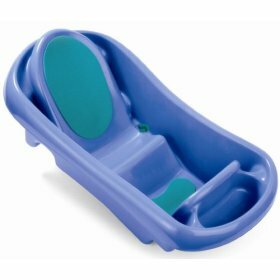 This tub can be made longer or shorter by a sliding mechanism, however, because of this feature, this tub is impossible to fill with water beyond the depth of ~1/2 inch, thus making it impossible to submerge a child of any age. My son screamed and screamed whenever we tried to bathe him in it, probably because he was wet and feeling cold. As a gift, after purchasing the tub I just mentioned, I received a Eurobath by Primo. This tub has some protrusions built in for a reclined position as well as an upright sitting position, but the tub is HUGE. It is way too big to keep in our Manhattan apartment. Also, it did not work well for our son in the first couple of months of his life, because he just did not fit securely in the reclined portion. After some research on the internet, I bought the Prince Lionheart washPOD. 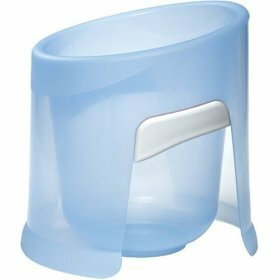 I’m pretty skeptical of any product that is advertised to be “like the womb…”, but I was desperate to bathe my son without him screaming the whole time, so I bought this $28 plastic bucket. It has smooth edges and a seating insert. My son LOVED this tub. He was submerged in water up to his chest, he could feel the walls of the tub with his arms and legs, providing a feeling of containment and this was finally when all three of us really started to enjoy bath time. My son stopped crying and screaming, and my husband and I could finally relax and look forward to when “that time” in the evening came around. The manufacturer says this washPOD can be used until the child is 6 months old. Now at 5 months of age, our son is too big for it (he’s 27.5 inches long), but it served us well and I’m really glad we bought it. Since my son has outgrown the washPOD, I had to go searching once again. My newest purchase in the bathing category is the The First Years Sure Comfort Deluxe Newborn to Toddler Tub. It is wonderful. The tub is not too big. The baby can be reclined or sitting, depending on how he/she is facing. The tub also comes with a material sling that snaps on and is meant to hold a younger baby atop the water. I am able to fill the tub, so my son is submerged up to his chest and does not get cold. At the age of 5 months, we are using the reclined sitting side, but I’m sure he will prefer the upright sitting portion pretty soon. I have used it for about 3 weeks now and am very satisfied.